Surfaced two face and heartwood two face with the exception of very minor sapwood along the edges of the piece. 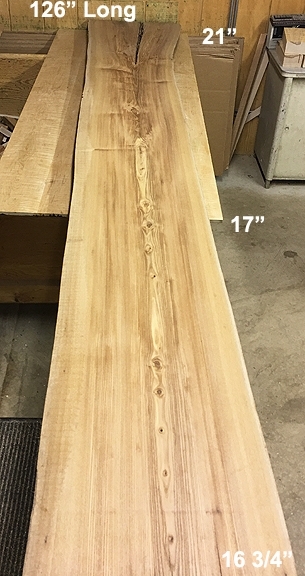 There are a series of small knots up the center of the board on both faces and there is 30" of ingrown bark where the single barrel begins to split into a "Y" for a double barrel tree as visible in the picture. Sister selection to FL0055 and FL0056 which are book-matched pieces sequentially cut from the same log as this piece. It's difficult to tell from the picture but the color of this wood is a beautiful reddish-milk chocolate color.